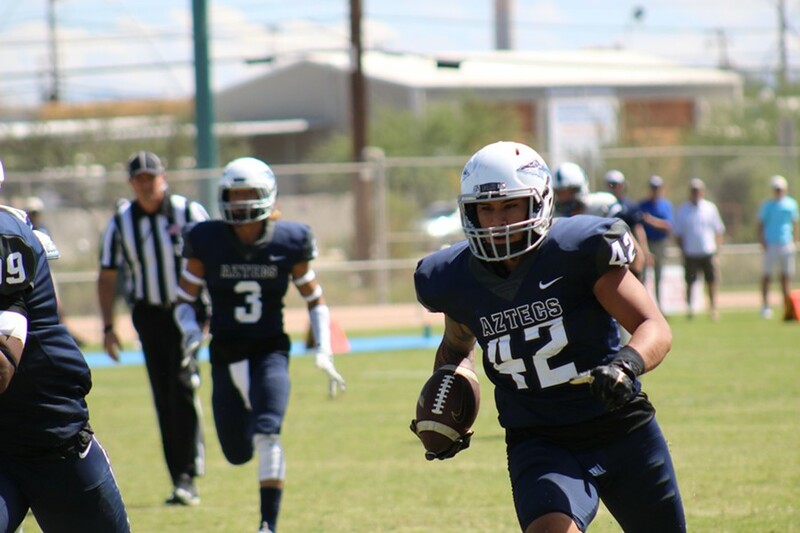 Austyne Carvalho-Toloai races down field with the ball during a 2017 football game with the Pima Community College Aztecs. Pima Community College Chancellor Lee Lambert laid out the future for the Tucson campus’s scaled-back athletic program from a lectern tucked inside a glass-enclosed lecture hall. Lambert, who less than a day prior had formally announced the elimination of the school’s football team, along with one of the two tennis and golf programs, said such a decision was a matter of simple economics. Lambert and Athletic Director Edgar Soto fielded questions about the college’s decision to cut some $600,000 from its $2.6 million athletics budget. Lambert said their decision to cut the school’s 100-man football squad, which started in 2000, came down to its outsized costs ($406,000 in 2017) and the lack of local competition. The latter part of that equation became a reality earlier this year when the Maricopa County Community College District announced the elimination of football in 2019 at Phoenix, Scottsdale, Mesa and Glendale community colleges. That move left Pima, Arizona Western and Eastern Arizona College as the lone schools with football teams—rendering it economically inefficient. Lambert said the football program was created as a self-supporting program, meaning it would not draw funds from athletic fees or the school’s general fund. But the economics didn’t work out, forcing the college to implement a student processing fee, with 80 percent of that fee going towards the programs. A second fee was implemented, stipulating 50 percent of its proceeds to the programs. The two fees generated roughly $1.9 million for the school. The school received an additional $732,000 via the general fund for athletics department positions and general funds transfers, according to PCC Executive Vice Chancellor for Finance and Administration David Bea. Lambert said the college officials believed football and other programs would soon draw enough fan interest to support themselves. “Unfortunately, that external support never really materialized at the college to sufficient levels to support a football or other athletic programs in any real meaningful way,” he said. A big issue for the programs was the college’s use of enrollment numbers, which have decreased year-over-year of-late, as a benchmark for fees. Soto said that he’s received an influx of messages from the community since the decision to cut sports was announced, but that most of those messages have been constructive. Lambert said that while the decision is sure to sting in the immediate future, football players can take solace in having their scholarships honored throughout their time at PCC.